ok, rrg, what game should we change to? anything but monopoly, it takes too long. Me: Spizzerinktum to blame for Teen Woes. nice to hear you elsewhere on the dial discussing Sun Ra, Irwin. Rex's oddities used to include a radio commercial for raisable chicks. In fact, I think it was on his "Ain't No Thing but a Chicken Wing" premium disc. Shout out to EVR. RIP as of Friday. Chorus of this reminds me of the johnny's gun song by the urinals. English dialect (U.S.) spizarinctum cash, specie, probably irregular from English specie. yesss this storm bugs song is the best! How does someone properly thank another for SPIZZERINKTUM, especially when it's a surprise! In the 1st half of the 20th C., chicken was not exactly a delicacy, but a somewhat luxury form of meat, hence the interest in a lot of people in getting into the biz. Somehow since then they've made chicken farming a lot cheaper. Maybe the trick was clipping their beaks. I think we can never know what happened that got the Chris-Cross BARRED. 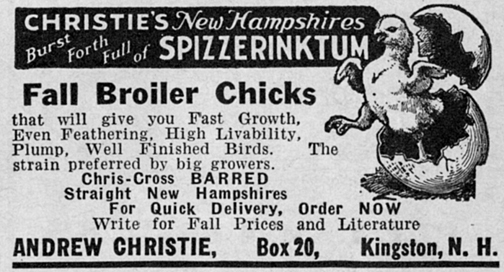 Did those Fall Broiler Chicks have a little too much High Livability, a little too much Spizzerinktum? LL, It's probably because they were wearing their pants backwards. Is the new schedule posted someplace? Egads - Please put Bob away.Poor ole Rach is rolling in his grave. Has Bob done anything with Willie Nelson? Anything listenable, I mean? I didn't hate that Bob. He's certainly been heading in that direction for some time it seems. Michael, Have you heard Bob's recent Chrysler commercial? Some of his finest work to date. Hey, I like that chlldren's album. Irwin's Lee is usually Morgan. Just finished reading The Viking of Sixth Avenue. It's a really good read, Moondog was an amazing man. Blee, I read that too. Incredible research, yeah? And what a finish -- every struggling artist's dream -- suddenly gain all the acclaim you ever thought you deserve. Wigwam, just beautiful. Pekka Pohjola played with Jukka Tolonen, too. agree with your 1st sentence there, Dean! Engineering question of the day: GPS vs. UTC - If you ask somebody what time it is and they tell you what time it is, do you know what time it is, what time it was or what time it may have been at some point in time? Prog is the proto-YR. YR's bad-boy cousin, visiting from the city. Prog spawned Yacht Rock?! Surely you jest! Droll, I know nothing. I'm just repeating what my ears tell me. Holy crap this is making me uncomfortable. Why can't i shut it off? for a soul to get to another soul..
Re: prog = yacht rock. What? What do Yes,'s "Tales from Topographic Oceans," Pink Floyd's "St. Tropez," or PFM's "L'Isola di Niente" have to do with yachts? That's not entirely true. Maybe if two people are similarly able-bodied I help the one I find more attractive first. But generally speaking I'd help the less able one. Or just not help at all. Unreliable narrator? He may have TAKEN it in a deprecating way. I alternated between feeling very sorry for this fictional character-narrator and thinking he deserved all the ill feeling he brought on himself. I missed Wordy McWordword? I will feign sorrow. LOL at the bladder jape. Streamed fine here in California. No problems over here. Hate buffering. Hate unbuffered even more. Bufferin will give you an Excedrin headache. Forced ads before choosen content is worse though. LL, of my generation, beats me to these lines all the time. Any chance at a sneak peak of the FMU schedule for June on? Having Evelyn Glennie follow Joe Black is like finally finding out what one unique sperm sounds like when it finds its prize in the womb of all possibilities. If you have buffering problems you may have low spizzerinktum. Ask your doctor if Damnitol is right for you. Lotsa other Californians on the list, for once. No buffering issues on 128k for me. But then again, I took TriOpenin before the show. Hey Irwin! Cool Zero 7 cut! generations are produced by alternate use of males from the pure lines on the crossed pullets. So. No mixed breed chickens. Chicken purity. Chicken Master Race. Chicken Supremacy. This made me think of BIRD RADIO - a 1-man band that is active in London. And that I saw play once at the bottom of an empty swimming pool; boy was there a lot of free beer. Hey, PMD. Sorry I'm short. Um, Andy's butler looked an awful lot like you. Side job? I am Andy's sock puppet. Sock puppet as in one of his new toy designs? Kids are going to love the Old Codger Sock Puppet, and parents are going to love the fact it has no small or sharp parts. And I, for one, welcome our new chick overlords. They don't say "Tastes like chicken" for no reason. Thanks for a Well Finished show bursting with Spizzerinktum, Irwin.